HMA consists of two basic ingredients: aggregate and asphalt binder. HMA mix design is the process of determining what aggregate to use, what asphalt binder to use and what the optimum combination of these two ingredients ought to be. There are several different methods used to go about this process, of which the Superpave, Marshall and Hveem methods are the most common. The mix design fundamentals discussed here are applicable to all mix design methods. WSDOT uses the Superpave mix design methods. 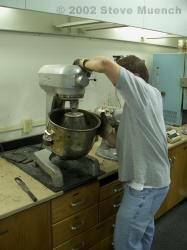 Some agencies and private laboratories use the Marshall method. Each method has been proven to produce quality HMA from which long-lasting pavements can be constructed. Aggregate. Items such as type (source), gradation and size, toughness and abrasion resistance, durability and soundness, shape and texture as well as cleanliness can be measured, judged and altered to some degree. Asphalt binder. Items such as type, durability, rheology, purity as well as additional modifying agents can be measured, judged and altered to some degree. The ratio of asphalt binder to aggregate. Usually expressed in terms of percent asphalt binder by total weight of HMA, this ratio has a profound effect on HMA pavement performance. Because of the wide differences in aggregate specific gravity, the proportion of asphalt binder expressed as a percentage of total weight can vary widely even though the volume of asphalt binder as a percentage of total volume remains quite constant. Deformation resistance. HMA should not distort (rut) or deform (shove) under traffic loading. HMA deformation is related to aggregate surface and abrasion characteristics, aggregate gradation, asphalt binder content and asphalt binder viscosity at high temperatures. Fatigue resistance. HMA should not crack when subjected to repeated loads over time. HMA fatigue cracking is related to asphalt binder content and stiffness. Low temperature cracking resistance. HMA should not crack when subjected to low ambient temperatures. Low temperature cracking is primarily a function of the asphalt binder low temperature stiffness. Durability. HMA should not age excessivly during production and service life. HMA durability is related to air voids as well as the asphalt binder film thickness around each aggregate particle. Moisture damage resistance. HMA should not degrade substantially from moisture penetration into the mix. Moisture damage resistance is related to air voids as well as aggregate mineral and chemical properties. Skid resistance. HMA placed as a surface course should provide sufficient friction when in contact with a vehicle's tire. Low skid resistance is generally related to aggregate characteristics or high asphalt binder content. Workability. HMA must be capable of being placed and compacted with reasonable effort. Workability is generally related to aggregate texture/shape/size/gradation, asphalt binder content and asphalt binder viscosity at mixing and laydown temperatures. Aggregate selection. Different agencies/owners specify different methods of aggregate acceptance. Typically, a battery of aggregate physical tests is run periodically on each particular aggregate source. 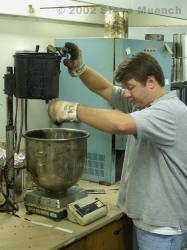 Then, for each mix design, gradation and size requirements are checked. Normally, aggregate from more than one crushing operation is required to meet gradation requirements. Asphalt binder selection. Different authorities can and do specify different methods of asphalt binder evaluation. 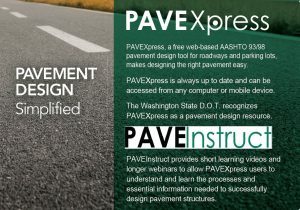 In Washington State, most agencies/owners use the Superpave PG system. 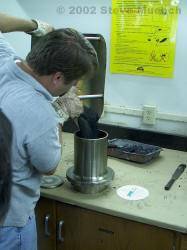 Previously, WSDOT had used aged residue (AR) viscosity grading. Make several trial mixes with different asphalt binder contents. Compact these trial mixes in the laboratory. This compaction is meant to be a rough simulation of actual field conditions. Run laboratory tests to determine key sample characteristics. Pick the asphalt binder content that best satisfies the mix design objectives. The end result of a successful mix design is a recommended mixture of aggregate and asphalt binder. This recommended mixture, which includes aggregate gradation and asphalt binder type is often referred to as the job mix formula (JMF). Although the JMF may subsequently be altered based on field performance, the mix design provides the initial JMF. For HMA manufacturing, target values of gradation and asphalt binder content are specified based on the JMF along with allowable specification bands to allow for inherent material and production variability (see Table 1 and Figure 2). These target values and specification bands are based on the JMF and not any general HMA gradation requirements. Thus, the mix designer is allowed substantial freedom in choosing a particular gradation for the JMF and then the manufacturer is expected to adhere quite closely to this JMF gradation during production. 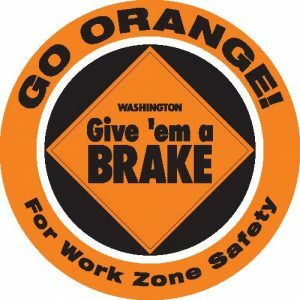 WSDOT. The contractor develops a mix design in accordance with WSDOT Standard Operating Procedure 732 (this is the Superpave method of mix design) and meeting the requirements of the contract specifications. WSDOT approves the mix design for one calendar year (time limit can be extended if the contractor submits a letter that the aggregate and asphalt sources have not changed). Cities and Counties. Requirements vary. Typically, a city or county will require a mix design. Some cities and counties may allow a previously approved WSDOT mix design to be used. In general, it costs between $3,000 and $4,000 to develop a mix design. Given the option, paving contractors typically use one of their existing WSDOT mix designs or one that they know works well for the given material and application. Private owners. Requirements vary. Generally, contractors are allowed more freedom to select their own mix design, however it generally comes from an existing WSDOT mix design or one that they know works well for the given material and application.